And we're back. Take two. Season two. 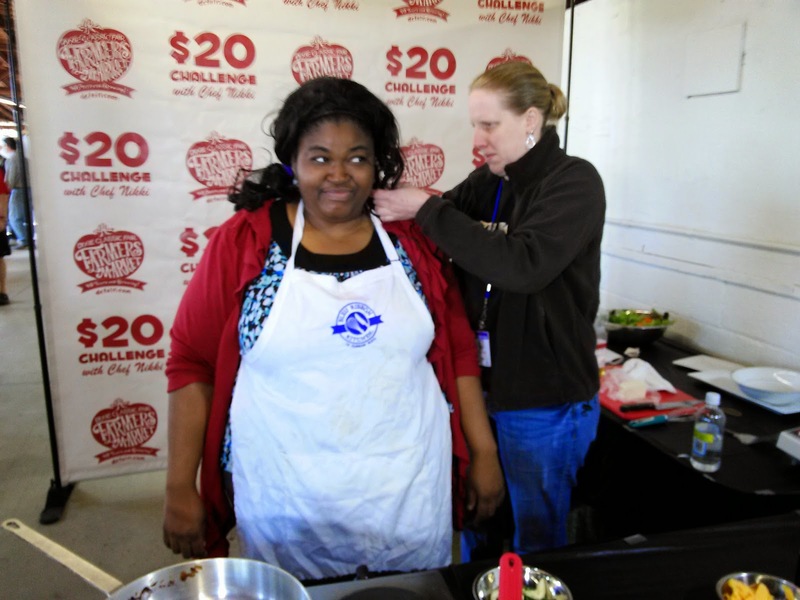 The $20 Challenge at the Dixie Classic Fair Farmers Market is back in full swing. I'm proud and happy to be able to do this project all over again! 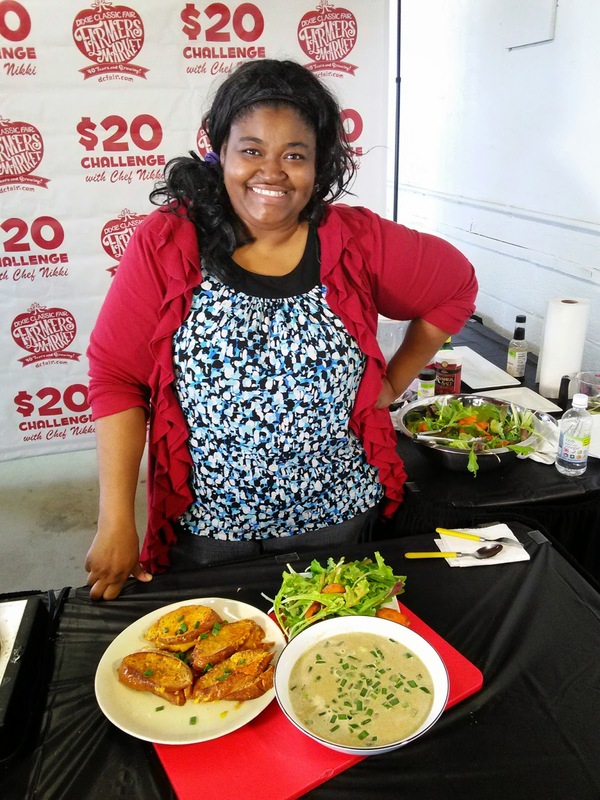 The message is still the same: To prove you can eat locally grown food AND stay within your grocery budget, the Dixie Classic Fair Farmers Market and the City of Winston-Salem is sponsoring the $20 Challenge the first Saturday of the month through September 2015. Beginning at 10 AM, I will stage a live cooking demonstration in which I will prepare a meal that can feed a family of four for $20 OR LESS only using ingredients I buy at the market that day. 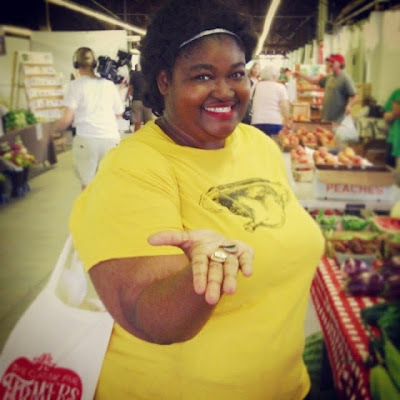 Did you not make it to the market on Saturday? Watch the $20 Challenge on WSTV-13 on Time Warner Cable (Channels 74.3 and 1303) OR subscribe to the City of Winston-Salem's You Tube channel. This month: I made out like a bandit and made a simple three course meal that any family would be happy to have. That's right. Inside-out grilled cheese. Cheese on the outside AND the inside. The top is a cheesy, crunchy, buttery layer that is melted into the fresh bread and the inside is ooey, gooey beautiful cheese that begs to be made over and over againbin the skillet. So I don't overwhelm you with recipes, the soup and the vinaigrette will be posted tomorrow. I want you to focus on watching the video below. Because it's good. I actually captivated myself while watching it! Use 1 Tablespoon of butter and spread it on one side of each slice of bread. Set aside. In a skillet over medium-low heat, melt 2 Tablespoons of butter. Lay two slices of cheese in the butter and place the bread, butter side down, on top of the cheese in the butter. Put some cheese on top of the bread slices and top with the other bread slice, buttered side up. As the cheese side is cooking and crisping up, which will take about 3-4 minutes, flip the sandwich to finish grilling the other side, another 3-4 minutes. Repeat the process to make the additional sandwiches. Face plant. I'm going to need to make this one asap! What a worthy challenge! I love farmers markets and so promoting them in this way is so so great! What a useful challenge! The sandwiches look great -- can't wait to see the rest of the recipes too. Great challenge you took on and I love what you came up with! Those cheese sandwiches look so delish! Oh - habanero cheese! Such a fun idea. I always like the crisped bits on the edges from the cheese that sneaks out, so I know I'd love these. The whole meal sounds delicious - and all for $20? Nice! I love this challenge! 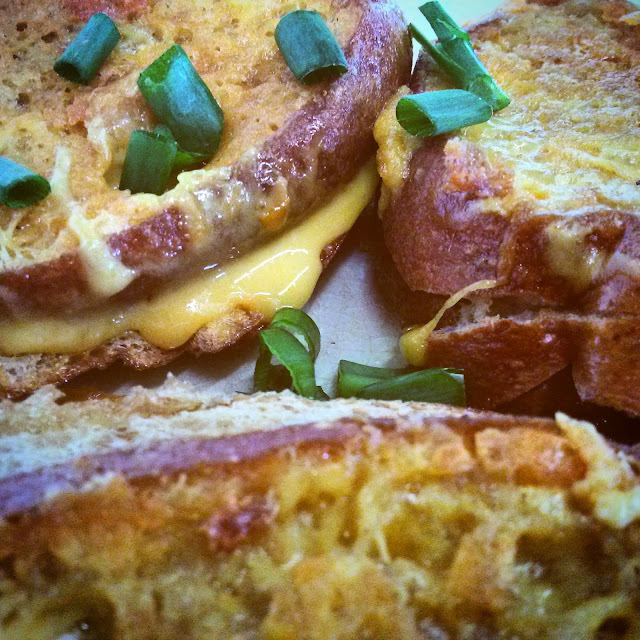 And that grilled cheese looks phenomenal - so oeey and gooey! Umm, YES to that inside out grilled cheese! That looks absolutely delicious! And what a great challenge! I love that you are showing how easy it is to shop local with a tight budget. This sandwich is totally calling my name!